Snacks are a big deal in my house. My daughters are ages 6 and 7 and are always on the go! Running in and out of the house, through the neighborhood, playing and simply being kids. All that playing can wear a kid out and what better to boost your energy than with food! Other than Lunch and Supper, I try not to make my girls food that's going to upset their tummies if they decide they want to go play some more right after their finished eating. Snack food ends up being our main go to area during these moments in the day. After a while, I've realized that most of the snacks that my kids eat are full of sugar and don't do much good for them except tame their hunger a bit and give them a 20 minutes "Sugar High" which makes the girls crash once all that sugar wears off... that's never a good thing! 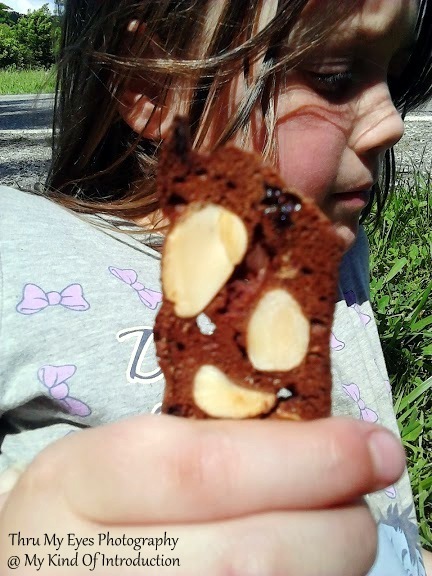 So when I received an email from an Almondina contact asking if I would be interested in trying out a sample pack of their biscuit cookies, in return for my thoughts and opinions, I wasn't about to say no and miss the chance to possibly discover a new delicious snack for my little girls. So, I quickly agreed and begin to wait for the package to arrive at my door. In less that 2 weeks, I was holding a box containing lots of Almondina Cookies in a variety of flavors! We received one tray per flavor except for the original which we got 2 trays of. Before I had a chance to look at all the flavors, Loran and Jade had already started snatching up a couple cookie trays and were on their way outside to try out their new snack! -- Almondina is an all-natural, crispy almond cookie that has no cholesterol, no added fat or salt or preservatives and has only 30 calories! -- Once a world renown musical conductor, Yuval Zaliouk has been the owner of Almondina for the past 20 years, with his company based in Ohio. -- Zaliouk's Almondina Cookies are created with love using the a special recipe that originally came from his Grandmother Dina. -- These cookies are now sold in all 50 States as well as in several foreign countries too. -- Almondina is All Natural, Healthful, Versatile, Crunchy, Addictive and come in Several different flavors! To my surprise, both flavors tasted great. Their sweet, crunchy and taste nothing like bread. Between Choconut and Original - My favorite was the Choconut, Jade was convinced that they tasted like coffee but I believe her 6yr old taste-buds were playing tricks on her since everyone else was loving the chocolaty taste. My fiance was at work when the Almondina Cookies arrived but he has just as much as a snack addiction as our girls do, so I knew he would be trying them out soon. Throughout the next couple days, I personally, ended up trying 4 out of the 6 cookie flavors that we received. The Cinnaroma and GingerSpice cookies disappeared -- My daughters ate the whole tray of both packs without me knowing so I missed out on those but since Loran and Jade ate every last Cinnaroma and GingerSpice cookie, they had to of tasted pretty great or I would of found the cookies later, just sitting alone wherever the girls were when they decided they didn't like them... All I found was empty packs laying on their bed, not even a crumb! When it came to the Almondina Sesame and Chocolate Cherry cookies - The unique flavor of the Sesame, quickly hooked Jade and I, they're definitely both of our favorites! I wasn't sure how the Sesame flavor - added to a crunchy, bread-like surface - could taste any where near sweet enough to be labeled a cookie. Who doesn't think of a Sesame Seed bun when you see the word Sesame? Once I took my first bite of the Sesame Cookie, the exotic flavor with a touch of sweetness over took my mouth and I swear that I felt my taste-buds do a little dance! Jade has been eating on the Sesame Cookies for a few days now, I've come to realize that she may be stretching the last few out to reach more than just one day, she's a silly but smart little girl so I believe she may be on to something good! 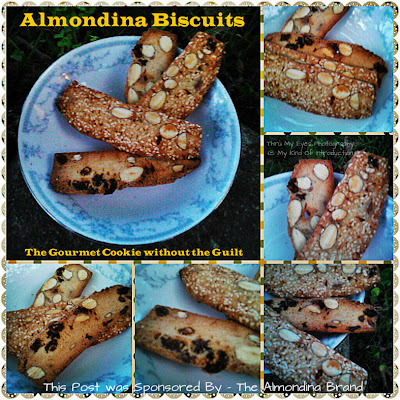 Once Alan was finally able to try the Almondina cookies he headed for the Chocolate Cherry! I had already ate a couple of them as well as giving a few cookies to a friend who wanted a taste. The chocolaty flavor was mixed with not only the real cherry taste but I'm pretty sure I saw and tasted big chunks of REAL cherries as well!! They were "out-of-this-world" delicious!! Where else can you find a chocolate crunch and a real cherry squish in one cookie? (I'm not talking about the fake fruity squish, these were REAL Fresh cherry squish bits!) Before I realized it, Alan had eaten the rest of the Chocolate Cherry cookies in a matter in minutes! His response when I asked him what he thought, was..... "Those were bangin'!" Translation -- "Those were awesome!" Which surprised me since he was eating the Chocolate ones, Alan don't eat alot of food with chocolate flavoring because he says it's too sweet, but apparently the Almondina Chocolate Cherry Biscuit Cookies had just the right about of chocolate that the sweetness didn't take over and it didn't hurt one bit that my fiance just happens to loves cherries! --The Almonds were visible in every cookie but the taste never overpowered the other flavors, which made me extremely happy! 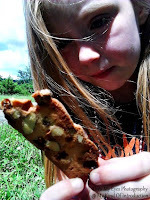 I couldn't of chosen a better healthy cookie to give to my little girls. Not only are they super delicious but the health factors truly blow my mind! Would also make a wonderful little breakfast on the go! You can not only order these yummy gourmet cookies online but in many stores as well!! The Almondina Brand can be found in stores such as - Walmart, TJ Maxx, MarshallsPublix, Trader Joe's, Whole Foods, Giant Eagle, Mollie Stone's, Hannaford, Jewel, The Fresh Market, Fairway, Cost Plus World Market, Publix, Trader Joe's and so many more! View Almondina's complete distribution on their site. One of my favorite parts about the Almondina Brand - other than their cookies - Is the story behind the cookies... Grandmother Dina! Keep an eye out for a #Giveaway soon!! 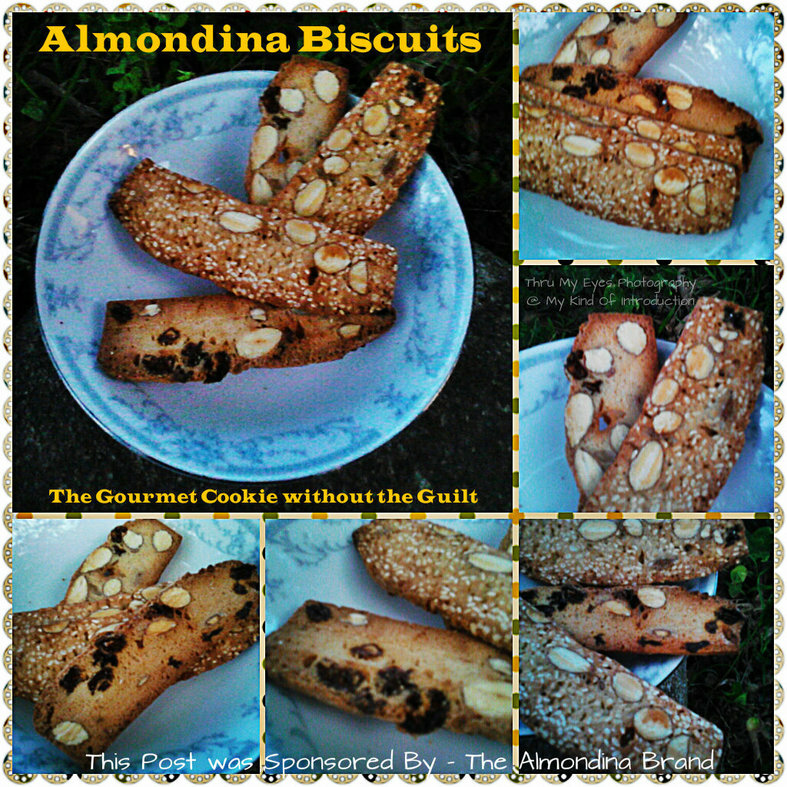 Be on the look out for the Almondina Giveaway around Friday, June 28! Disclaimer: I received the product(s) mentioned above, complimentary from the sponsor in return for my honest thoughts and opinions. All opinions are all my own and may differ from your own. Even though some sort of compensation may have been received, I only write about products that I have personally used and/or believe my readers will enjoy or benefit from. I am disclosing this in accordance with the Federal Trade Commission's16 CFR, Part 255: "Guides Concerning the Use of Endorsements and Testimonials in Advertising." See Full Disclosure for further details. This look great - I wish they were gluten-free so I could share with my daughters! The chocolate cherry are my favorite! They look tasty, they would make a great giveaway prize!